Vegetable cellulose, astaxanthin, natural non-GMO soy tocopherols (antioxidant), brewer's yeast (saccharomyces cerevisiae), lactobacillus bulgaricus. Contains soy. Adults take 1 capsule daily. Best taken with food. Not intended for children. High potency RAW K-Complex provides 150% of the Daily Value for Vitamin K, including RAW MK-7 (Vitamin K2) which is gently extracted at low temperatures from fermented Bacillus subtilis Natto. 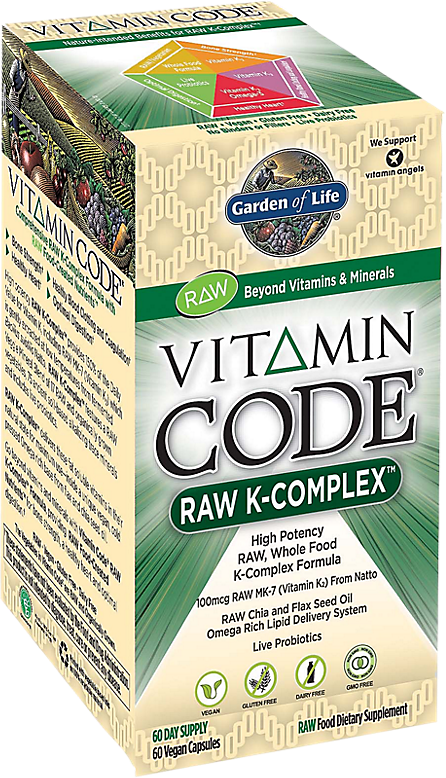 RAW K-Complex features a RAW Veggie Mineral Blend of 17 RAW and organically grown vegetables, 75 ancient soil-based alkalizing trace minerals and includes live probiotics. RAW K-Complex delivers these fat soluble vitamins in their natural state for maximum use- inside a unique vegan, cold pressed Omega rich base from flax and chia seed oil. Other ingredients: Vegetable cellulose, astaxanthin, natural non-GMO soy tocopherols (antixidant), Brewer's yeast (Saccharomyces cerevisiae), Lactobacillus Bulgaricus. 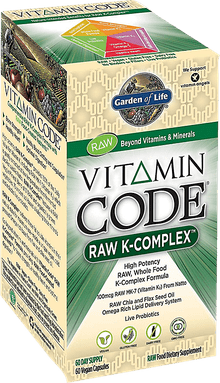 RAW Vitamin K Complex contains 100 mcg RAW Whole Food Vitamin K2 as Menequinone 7 from Natto (fermented soy), the only natural source. As with any dietary supplement, consult your healthcare practitioner before using this product especially if you are pregnant, nursing, anticipate surgery, take medication (particularly blood thinners) on a regular basis or are otherwise under medical supervision.